Once upon a time, a very wise man said "...logic will get you from A to Z, but imagination will get you everywhere." Long before the adult world got its hands on you and stifled your creativity, long before you became jaded by the ways of the world, long before you knew the limits of your own mind... you were a child. You lived in a world where reality and fantasy were not only separated by a blurred line, but they overlapped. One could slay a dragon on his way to work, or hop aboard a broomstick to make it to school on time. Princes and princesses, knights and castles, belles of the ball, and beasts of the forest, everything existed in mismatched harmony, and somehow, everyone lived happily ever after. Little Adventures® - Everyday dress-up clothes for everyday adventures. What was your dream when you were a child? Everyone had one. Mine was to wear sparkly costumes and to ride the elephants in the circus (I was busy chasing neither fame nor fortune apparently). My oldest son wanted to be a Power Ranger for a long time before he realized they were make-believe characters that didn't actually have superhuman ninja skills. But what if we stopped forcing our children to face reality at such a young age? What if we just let them play make-believe for a little while longer? Encouraged them to let their imaginations run wild for just a few more years? Let them believe that there really were leprechauns hiding at the end of rainbows wth real pots of gold, and that princesses with magical crowns really did exist! Two mothers set out to do just that. They wanted to make dress-up fun again. And to make clothes that kids could actually wear... year round... without falling apart. The concept seemed so simple, but is it exactly what was missing from most young children's wardrobes. In place of princess gowns and flowing skirts, hung school uniforms and denim jackets. In place of knight's armor and shields, hung button-down shirts and dreaded "dress-up pants." 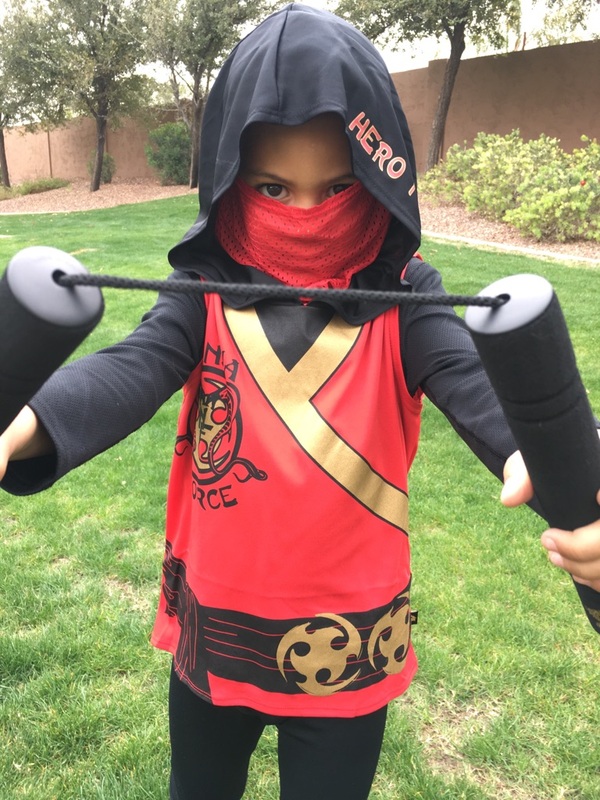 Little Adventures was kind enough to send a costume for my six-year old to try out. For those who know Keylen, he is tough as nails on everything he wears - like his school uniform pants that are ALL missing knees. This Ninja costume was an instant hit and Key couldn't wait to put it on; I even had to wrestle him out of it before bed. The quality and affordability of these outfits is unmatched; we may never buy a regular, cheap, falling-apart-at the seams, overpriced, Halloween costume again. I love what that this brand stands for and the imagination and creativity that it fosters in little kiddos. Let your little ones laugh, let them play, and most importantly, just let them be little. For a 15% discount on your purchase - good now through April 10 - use code lapromo-ssm at the checkout.